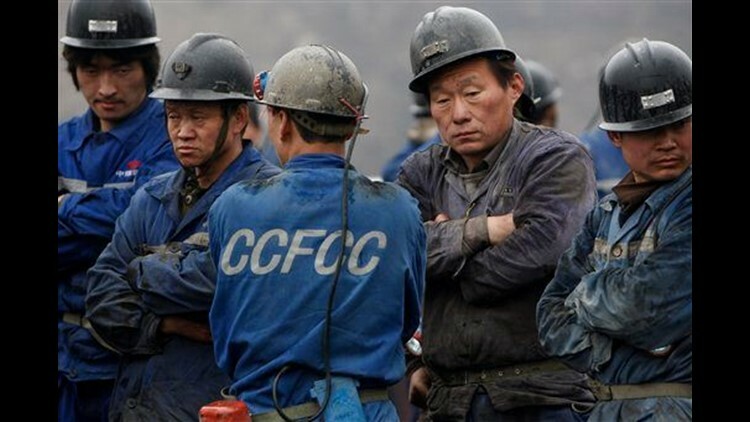 XIANGNING, China (AP) — Rescuers working in a drizzling rain raced Monday to free 153 coal miners trapped deep underground by a flood that may have started when workers digging a new mine in northern China accidentally broke into a network of old, water-filled shafts. Such derelict tunnels are posing new risks to miners across China even as the country improves safety in its notoriously hazardous mines, where accidents kill thousands each year. So far, there has been no contact with the trapped miners, more than 24 hours after the flooding. "Their situation until now is still unknown so that is making everyone very worried," said Liu Dezheng, a chief engineer with the work safety bureau in northern China's Shanxi province, where the mine is located. Rescuers worked to pump water from the Wangjialing coal mine. The state-owned mine about 400 miles (650 kilometers) southwest of Beijing was under construction and had been scheduled to start production later this year, the China Daily newspaper reported. The accident could become one of the worst mining disasters in recent years if rescue efforts fail and would set back marked improvements in mining safety. Liu warned that any rescue was still days away, and workers were being put on four-hour shifts to make sure they got enough rest. "This is not something that can be achieved in one or two days," Liu said. "(Rescuers) must be prepared to work at least seven days and seven nights." Some 261 workers were inside the Wangjialing mine when it flooded Sunday, and 108 escaped or were rescued, China's State Administration of Work Safety said in a statement on its Web site early Monday. State television said the workers were trapped in nine different places in the mine, which was flooded with up to 5 million cubic feet (140,000 cubic meters) of water. At the mine, located at the end of a long winding mountain road, rescue workers strapped metal pipes and other parts of a pump onto a metal trolley and pushed it along rail tracks into the entrance, where it was lowered into the shaft. About 30 people, many of them miners, stood quietly behind the police cordon watching the rescuers work. Fan Leisheng, one of the miners who escaped, described the sudden rush of water that tore through the mine. "It looked like a tidal wave, and I was so scared," Fan told China Central Television. "I immediately ran away and looked back to see some others hanging behind. I shouted at them to get out. It was unbelievable because I got out from 1,000 meters (3,280 feet) underground." The official Xinhua News Agency reported that President Hu Jintao ordered local authorities to "spare no effort" in saving the trapped workers. Officials have yet to declare the cause of the accident, but experts said it was likely that workers broke into the old shafts or pits of derelict mines that had filled with water. "It could be that they broke into old workings, works that were not properly mapped out," said David Feickert, a coal mine safety adviser to the Chinese government. "That's a common problem with flooding, and Shanxi is an area where they have very extensive mining, a lot of old mines." Though China's mining industry is still the world's deadliest, it has dramatically improved its safety record over the last seven years, said Feickert, who is based in Wanganui, New Zealand and Beijing. Accidents killed 2,631 coal miners last year, fewer than half the 6,995 deaths in 2002, the most dangerous year on record, according to the State Administration of Coal Mine Safety. That means on average more than seven miners die every day, down from 19.1 in 2002. The decline in deaths comes amid a ramping up in the mining of coal, which fuels about 70 percent of China's voracious energy needs. Much of the safety improvement has come from shutting down smaller, labor-intensive operators or forcing them into mergers with better-funded state companies. Lu Jianzhang, a former researcher with the China Coal Research Institute in Beijing, also said that he suspected old mine shafts were to blame. If that were the case, it could brighten the prospects of finding survivors, he said. "Since the amount of the water is limited and runs out after the initial flood, there is still probably hope for miners' survival," Lu said. Wangjialing's parent company, Huajin Coking Coal Co., is co-owned by China's second-largest coal mining company, the China National Coal Group Corp., with the remaining 50 percent stake owned by the Shanxi Coking Coal Group Co., another major miner. The worst accidents in recent years include a coal mine flood in eastern Shandong province in August 2007 that left 172 miners dead and a mine blast in northeastern Liaoning province in February 2005 that killed 214 miners.